Crossplane Capital has expanded its team with the hiring of Katie Oswald as director of business development. Ms. Oswald is responsible for sourcing investment opportunities, developing relationships with transaction advisors, and managing the firm’s marketing strategy. 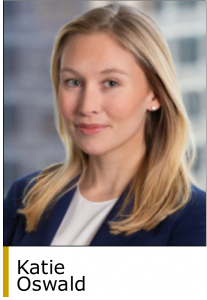 Before joining Crossplane, Ms. Oswald was a member of the business development team of Gauge Capital from July 2017 to March 2019. Prior to her time with Gauge, she served as the chief financial officer of a Dallas-based family office. She began her career in the audit practice of KPMG and is a CPA. Crossplane makes control investments of up to $120 million in North American companies that have $40 million to $200 million in revenue and up to $15 million of EBITDA. The firm has a specific interest in family-owned businesses and companies that are experiencing financial or operational underperformance or are in a cyclically out-of-favor industry. Sectors of interest include niche manufacturing, value-added distribution and industrial business services. Crossplane Capital was founded in November 2018 by Mr. Hegi and Mr. Eakes and is headquartered in Dallas (www.crossplanecapital.com).